The meeting was held at Beth’s home. Thank you Beth for a warm reception and wonderful goodies and wine! We had the largest attendance in a long time, nine members were present. Along with Beth and Michèle, Betty, Carla, Collette, Joan, Jolene, Linda and Shirley were present. We also received written comments from Janet. 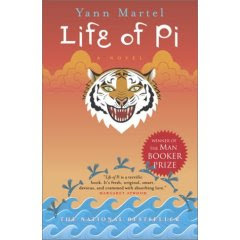 The book discussed at this meeting was Life of Pi by Yann Martel, Jolene’s choice. The novel won the Mann Booker Prize in 2002. Mr. Martel is a Canadian who was born in Spain in 1963 to Canadian diplomats. He received an undergraduate degree in Philosophy from Trent University in Peterborough. Life of Pi is his second book. Martel also publishes a letter to Prime Minister Harper every two weeks with a book suggestion for him to read. The letters and the list of books that have been suggested are on the website What is Stephen Harper reading . Most members thought that the book is well written and that Martel is an excellent storyteller. Some members had read the book twice and found it more enjoyable the second time. Only some however, found the book enjoyable. The story of a teenage Indian boy named Piscine (Pi) Molitor Patel, begins with a description of his life in the Pondicherry region of India, his family, the family zoo his father manages and Piscine’s interest in several religions. Pi’s parents decide to immigrate to Canada and leave on a ship with a menagerie of animals. When the ship sinks, Pi is the only survivor along with a zebra, a hyena, an orangutan and a Bengal tiger. The rest of the story is one of survival on the lifeboat. Beth told us about a radio interview she heard with Martel and how he came to write this book. He had traveled to India and had a bit of a writing block while trying to write another book. A lot of what he said is in the preface of the book and Beth found it important to read before reading the book. Several members wondered if the story as Pi told it when he was finally rescued was real or if he used his imagination as a coping mechanism for survival, a way to keep him alive a bit like the role of the basketball in the film Castaway. When he is interviewed by the Japanese owners of the ship that sank, he tells two stories and challenges them to decide which is the real story. Carla felt that the story and the book stayed with you, though it was a fairly easy read, is quite thought provoking. There was also some discussion on the considerable knowledge this 16 year old boy had and whether it was credible that he would know so much about animals and religions. Carla thought he might be what we call an "old soul". Janet saw it as an allegory. She sent us the following comment: “The story begins with Pi's journey of faith and at the end challenges the reader to either take it on faith or disbelieve. Of course, Martel means it to be an allegory of the journey of faith that we each must take. Yet in the end, it falls short as an allegory for there is no deeper truth.” . It certainly links the beginning of Pi’s life in India to his harrowing ordeal. This book elicited considerable discussion and the evening was very interesting! April’s meeting at Linda’s home is Beth choice City of Falling Angels by John Berendt on April 28th. For additional insights, see the Comments section for January 2016, and a link to a site where author Yann Martel discusses his book The High Mountains of Portugal and the technique often called "magic realism."